When we recently had cause to get rid of our washing machine, I had two choices. I could get it in the back of our spangly estate, no problem – if I didn’t mind the risk of “bad water” from the plumbing getting into the upholstery (and didn’t trash the bodywork pulling it out at the other end). Or, there was the Carry Freedom Y-Frame. I have no idea what the weight of our washing machine was – apparently they average 65-70kg – but it was certainly heavy. In order to get it loaded up without aid, I had to strap the trailer on sideways and then tip the whole thing horizontal. No way I could have lifted it onto the trailer as usual! 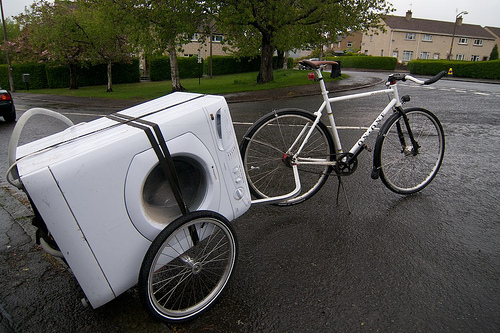 Anyway, in less time than it takes an Evening News online commentator to count their own toes, the washing machine was onto the trailer and the trailer hitched to the bike. Stopping only to grab a couple of pictures of this historic moment, I powered off to the recycling at Old Dalkeith Rd. The bar for trailer use has now been set stratospherically high – after coving, other bikes, a dead body’s worth of lumber, fridges and freezers and finally a washing machine, there’s really only one place to go, and that’s carrying a car on a bike trailer, something that the Y-Frame isn’t geometrically capable of. Even a Mini is about ten times the weight limit, sadly.